Most golfers know that causing their ball to move incurs a penalty of one stroke, under Rule 18-2, and that the ball must then be replaced. However, there are some circumstances where a player does not incur a penalty for accidentally moving their ball, which I am listing here. 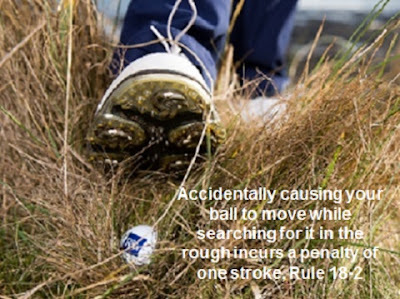 • A ball that that has been placed in the teeing ground at the start of a hole is not in play until a stroke has been made at it, so no penalty is incurred if it is accidentally moved before any stroke is made, Rule 11-3. • From 1st January 2017 USGA and R&A have recommended that Committees introduce a Local Rule to the effect that when a player’s ball lies on the putting green, there is no penalty if the ball (or ball-marker) is accidentally moved by the player, their partner, their opponent or any of their caddies, or their equipment. (Note: If your Committee has not yet introduced this Local Rule they should do so immediately). • There is no penalty if a player causes their ball to move while moving a movable obstruction (i.e. anything artificial), providing the movement of the ball is directly attributable to the removal of the obstruction, Rule 24-1. • A penalty is usually incurred if a ball is accidentally moved while searching for it under Rule 18-2, but there are three exceptions, which are detailed in Rule 12-1. Briefly they are; a) searching for or identifying ball covered by sand, c) searching for ball in water in water hazard, and d) searching for ball within obstruction or abnormal ground condition. [Note: b) was removed on 8th November 2018, as a player does incur a penalty while searching for a ball in loose impediments in a hazard, but not if they cause their ball to move when replacing those loose impediments]. • If a player accidentally touches their ball with their club causing it to rock off its spot, but it returns to its original position, it has not moved according to the Definition of Moved and no penalty is incurred, Decision 18/2. • There is no penalty if a player accidentally moves their ball while measuring, e.g. to determine whether a dropped ball has rolled outside the permitted area, Rule 18-2. • If a player accidentally moves their ball in the directly attributable act of its lifting, marking, placing or replacing under a Rule, there is no penalty and the ball must be replaced, Rules 20-1 and 20-3. Regarding searching for a ball, it is worth noting that if a player who is searching for their ball, say on the bank of a water hazard or in a bush, and they cause it to move, they incur the penalty of one stroke immediately and cannot avoid it by then choosing to take relief under penalty from the hazard or deeming it unplayable in the bush. I am receiving a number of emails from subscribers saying that they have started receiving my weekly ‘Rhodes Rules School’ emails again, having not received any since April of this year. I can offer no explanation for this, but can assure you that the AWeber email service company records show that my emails were apparently sent each week, but have not been opened by the various recipients. In order to prevent this happening again I recommend that you send me an email (to barry at barry rhodes dot com) with just “TEST” in the subject line and I will respond with a test reply. This should ensure that my email address is added to your email address book and should avoid anything sent from me being filtered as junk or spam mail. If you are one of those that did not receive all my weekly emails, please let me know and I will revert your subscription to the most recent one that you did open. If you would like to start receiving my weekly ‘Rhodes Rules School’ emails, which start with Rules questions based on accompanying photos or diagrams, just click on this link. A description of this 'Photo Series' can be found at this link.